Deer are ancient ruminant mammals belonging to the Cervidae family. It is mostly found grazing in grasslands and forests. It varies widely in terms of size, body shape, color and patterns. The most striking features of a deer are its high speed, antlers and diligence. 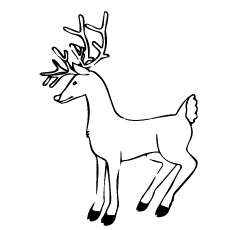 There are various species in the deer family. Some common species include white-tailed deer, mule deer, moose, red deer, fallow deer, chital and reindeer. Don’t you feel like teaching your child more about these wonderful creatures? Here is an interesting way to do the job. 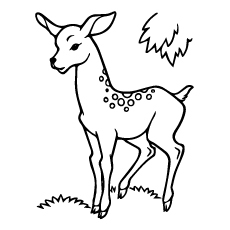 Print out some coloring pages with drawings of deer on them and ask your child to paint his imagination! 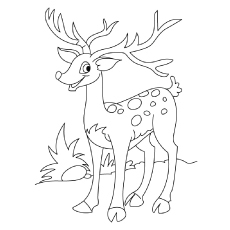 Deer are one of the favorite animals of kids. 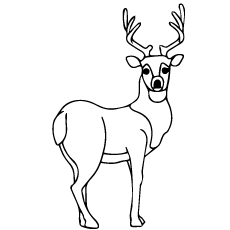 Here is a collection of deer coloring sheets of different species of deer. 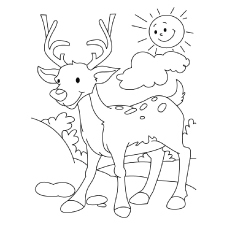 The article includes both realistic and cartoon coloring pages of deer. Deer are one of the most common animals found on the planet. They are found on every continent except Australia and Antarctica. Deer are meek and harmless animals. It is due to their meekness that they become a prey of several animals. Roe deer are native to Britain. They have been present since the Mesolithic period. 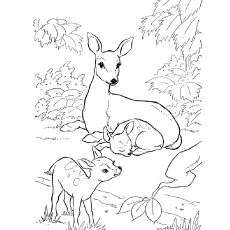 Give your child a feel of nature with this coloring sheet featuring a white-tailed deer. Here are some interesting aspects of white-tailed deer. White-tailed is a medium-sized deer. Its color ranges from brown to grayish brown. It is native to America. The white-tailed deer have a prominent white underside to its tail. 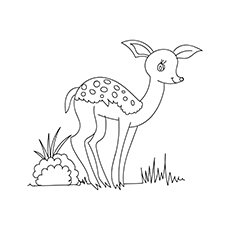 Make sure your child makes the white patch on the tail while coloring this sheet. Red deer are characterized by an even number of toes and a four-chambered stomach. They have a beautiful coat in the shade of red. Some red deer also have an orange coat. The coat turns gray in winter. Elks lose their antlers every March, but grow them back in May. Elks migrate to high mountain grazing ground in early summer. 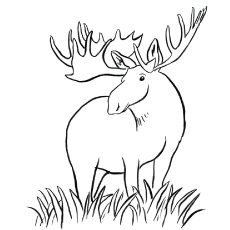 The moose are the tallest and the largest of all the deer. They are mostly found in cooler climates of northern parts of Asia, Europe and the United States. Moose have a long face. They also have a flap of skin hanging under the throat. Despite their large size, moose are excellent swimmers. They can swim several miles in search of food. The mule has forked antlers, a black-tipped tail and a white patch on their sides. It differentiates these deer from other species. The grayish brown coat of the mule allows him to adapt to the desert surroundings. Caribou, also known as reindeer inhabits the Arctic and sub-arctic regions. They appeal greatly to the children because of their connection with the holiday season. Caribou is the only specie of deer where both male and female deer have antlers. Caribou has two thick layers of fur. It acts as an insulator in the freezing weather. Indian Muntjac, also known as the barking deer, is found widely in South East Asia. They produce a bark-like sound when they sense a danger approaching. Indian Muntjac is carnivorous specie of deer. It is known to eat bird’s eggs along with the shoots and grass. 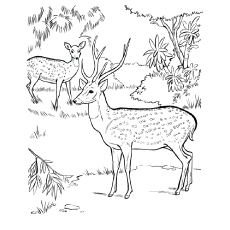 This coloring sheet features a Sika deer with large antlers turning its head. The Sika deer got its name from the word “Shika”, which translates to deer in Japanese language. Sika deer is also called spotted deer. Sika is one of the few deer that does not lose its spots upon reaching maturity. 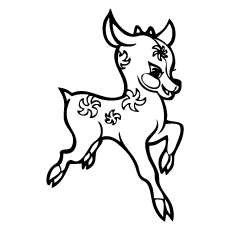 Sambar is a forest dweller and prefers hills. 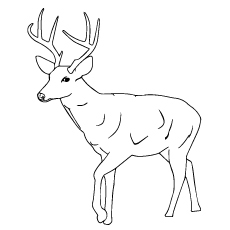 The color of the deer ranges between brown and gray. The deer’s hair falls in the summers. Fallow deer are excellent jumpers. They can jump 2 to 5 feet across. There are four sub-types of this species. Each has a different coat pattern and a different color. Sven, the reindeer, is one of the primary characters in Disney’s feature film “Frozen”. 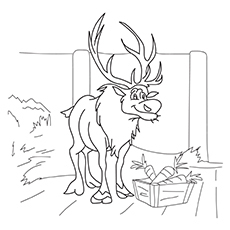 It is a large, tan reindeer with brown eyes. Sven is the pet reindeer and companion of Kristoff. He runs an ice investing agency along with Kristoff outside the Valley of the Living Rock. Sven is a loyal and goofy reindeer. He has a strong moral character and constantly convinces Kristoff to do the right thing. 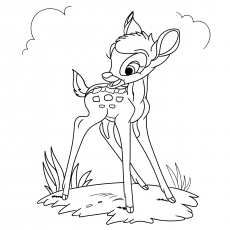 This is one of the cute deer pictures to color that shows Bambi, the main protagonist of the film of the same name. 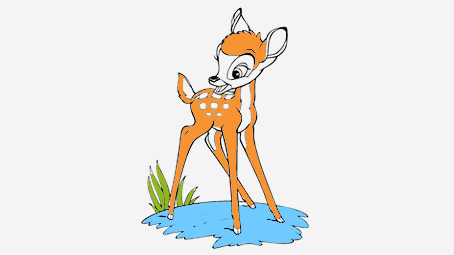 It is an orange colored-deer with wide eyes, spindly legs and a cute voice. Chital deer, as the name suggests, has bright spots in the body. It occurs in huge numbers across the Indian Subcontinents. It inhibits the fringes of the forests and grasslands. It has a shining, fawn coat with bright spots on its body. They hardly change color in summers. Chital are very sociable animals. They prefer to stay in herds. 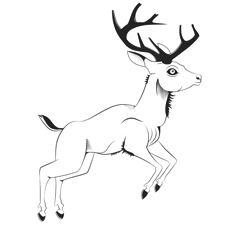 Hog is a small, stout deer related to the chital deer family. It is named for its peculiar habit of running like a hog with its head down. The hog deer have a long body with short legs. The color of their coat varies from brown to dark brown with a reddish tinge. The hog deer inhabit the grasslands of Corbett and Assam. 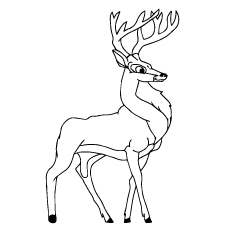 This is one of the interesting deer coloring pictures featuring a Hangul deer standing on a plateau. It is found commonly in Europe and the valley of Kashmir. The coat of this deer has flecks of pale hair that provides them with protection. In winter, the color of the coat becomes uniform and merges with the landscape. 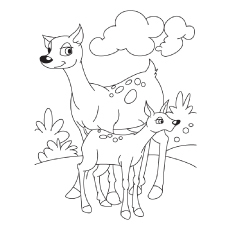 This coloring sheet will provide your child with the idea of the forest atmosphere. It reflects the protective and caring nature of the mother doe for her children. Tell your child to write a short story to go with this coloring sheet. 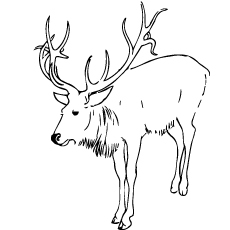 Thamin deer is found only in the Manipur region of eastern India. They are also called the dancing deer due to their delicate style of walking. Thamin deer prefers woodland and undulating land nears rivers and marshland to thrive. The most significant feature of this buck is its antlers that can reach a length of 2 meters. The antlers grow outwards and then inwards. The black buck is specie of antelope native to India. It is classified as a threatened species because of its rapid decline during the 20th century. It is a medium-sized, black and white buck with long horns. Young bucks are light brown in color. They turn black or dark brown as they reach the age of three. Black bucks are territorial, but take occasional trips to surrounding terrain. The average lifespan of a black buck is 12 to 16 years. 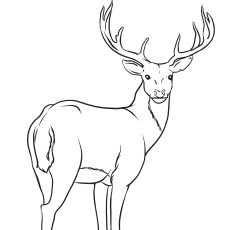 The free deer coloring pages to print depict the deer in various settings, natural as well as captive. The varied and interesting coloration and patterns of deer allows children to play with different colors. 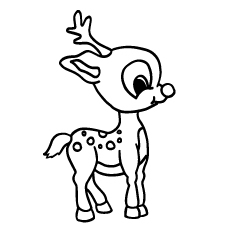 We hope your kids like these free printable deer coloring pages online. 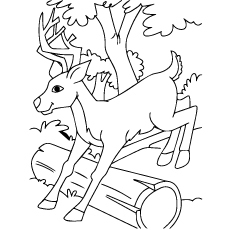 Do share with us which deer does your child enjoys coloring the most.